Background- Laparoscopic adjustable gastric band (LAGB) and Laparoscopic sleeve gastrectomy (LSG) have become two most widely used restrictive procedures. The aim of this retrospective analysis was to compare the two procedures in terms of outcomes in different BMI groups (stages of the disease). Methods- There were 1084 LAGB performed between April 2005 – July2009 for patients withBMI 35- 89. Patients were divided into three groups – BMI< 50 (n=887) ,BMI 50-60 (n=171)and BMI>60(n=26). Similarly 50 LSG performed between January 2008 – July 2009 for patients with BMI- 35-70.7 were divided in three groups – BMI< 50 (n=31) ,BMI 50-60 (n=14)and BMI>60(n=5). Average BMI and %EBWL before surgery, at 6 months and 1 year after surgery were compared between groups of patients treated with both procedures. BMI <50 group – baseline BMI was 42.6 and 42.5 for LAGB and LSG, respectively. At 6 months – BMI was 37.8 with %EBWL of 28.1% for LAGB compared to 35 and 53.6% for LSG. At 1 year BMI and %EBWL was 36.6 and 35.7% for LAGB compared to 32.9 and 60.6% for LSG. BMI 50-60 group – baseline BMI was 53.6 and 52.8 for LAGB and LSG. At 6 months – BMI was 47.3 with %EBWL of 22.1% for LAGB compared to 40.3 and 45.8% for LSG. At 1 year BMI and %EBWL were 45.4 and 28.3% for LAGB compared to 37.9 and 57.4% for LSG. BMI >60 group – baseline BMI was 64.5 and 62.3 for LAGB and LSG. At 6 months – BMI was 54 with %EBWL of 24.9% for LAGB compared to 47.5 and 36.2% for LSG. At 1 year BMI and %EBWL was 50.6 and 32.8% for LAGB as compared to 45.15 and 42.8% for LSG. There was no mortality in LAGB and LSG groups. Overall in LSG was 10.3% including 4 cases of gastric leak requiring multiple admissions and procedures. 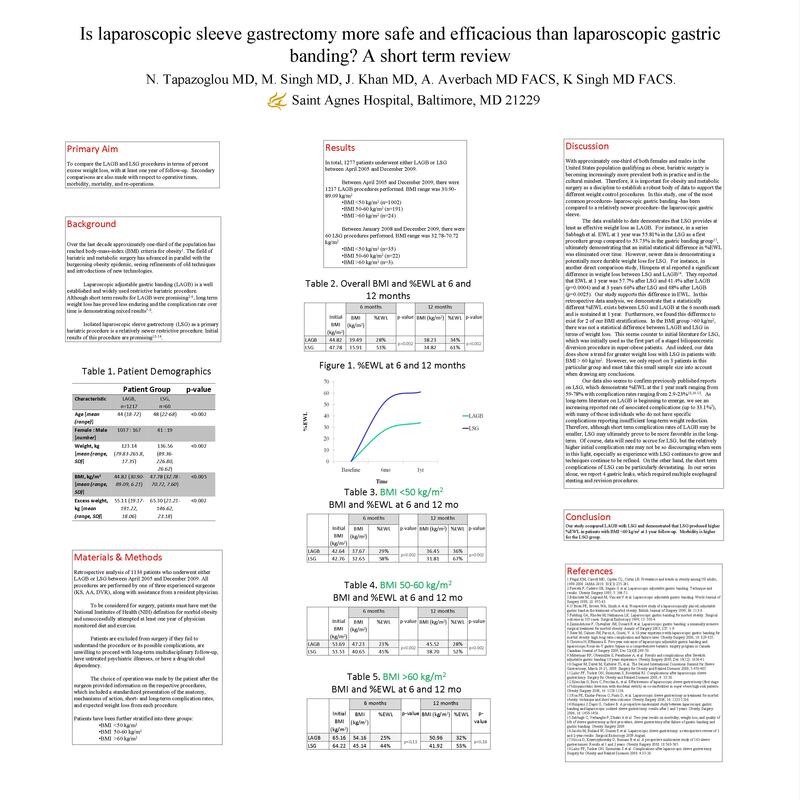 With LAGB , overall morbidity was 2.4% in form of slippage, port site complications , erosions and and inadequate weight loss requiring conversion to gastric bypass or LSG. LSG appears to produce higher weight loss in both all patients and in different BMI groups compared to LAGB at least at 1 year of follow-up. Morbidity appears to be higher with LSG.